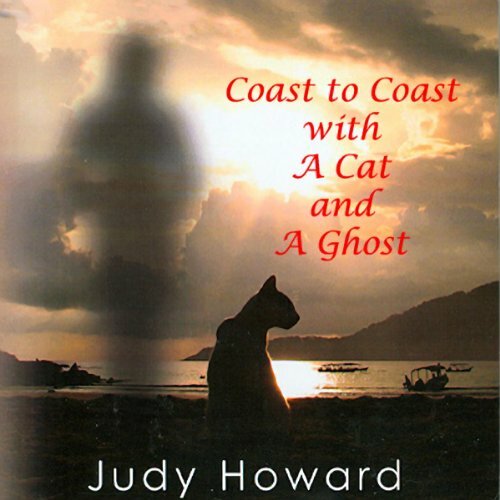 Coast to Coast with a Cat and a Ghost is an autobiographical account by Judy Howard, that follows the author's road trip across country after the death of her loving yet at times abusive husband. When her husband of twenty-five years, Jack, passes away, Howard is faced with an overwhelming sense of loss. She takes to the road in her Winnebago on a journey of self-discovery accompanied by her cat, Sportster, and Jack Incarnate, a life-size stuffed doll she creates with an eerie resemblance to her late husband. During their travels she and Sportster experience the beauty of the land as she resolves her troubled memories through conversations with the doll. She comes to terms with her deep love for her husband despite the abuse that was part of their relationship and discovers how she became a stronger woman for it. The audiobook is a narrative, both of physical travel and of emotional and spiritual evolvement, says Howard. It leads the reader through the hills and valleys and provides insights to fear and bravery. Howard aims to weave an emotionally-charged narrative with humorous anecdotes and a unique perspective on life, engaging and inspiring the listener. What did you love best about Coast to Coast with a Cat and a Ghost? The author made me feel as if I was experiencing the road trip with her. There were many things to like about this book. The delightful cat Sportster, the opinionated Jack Incarnate, and shocking memories made this book addicting. All the characters were fun to observe but Judy herself made it all come to life. Judy Howard is an excellent storyteller who makes the reader feel as if they were on the road with her and excites them into wanting to know what's next.